Layers of flavorful vegetables make up this fresh crisp salad. A perfect side to any meal any time. You can substitute in season vegetables throughout the year to add a little variety. Place chopped lettuce in a 9 x 13-inch pan. Layer the vegetables on top of the lettuce. 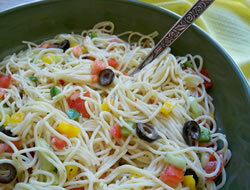 Pour ranch dressing on top of vegetables and spread out as evenly as possible. 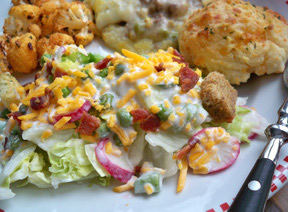 Cover with cheese and then bacon; top with croutons. Do not toss, leave in layers to serve. Refrigerate to chill before serving. 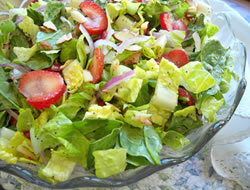 Note: You may not need the whole bunch of radishes for the salad. Cut thin slices of radishes and then place on the salad to create a single layer. 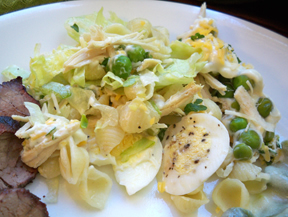 "I liked all the ingredients in this salad but I am not a big fan of Ranch dressing. I would have liked it better with a mayonnaise and sugar dressing or maybe with a French dressing (only because I prefer that over Ranch)."